However, since 2012 the American stock market has not collapsed but moved to new highs. So what is the explanation? My contention is that we are in a financial “greater-recession” (depression) but it does not “seem” so because it has not yet become a true economic depression. Let me explain. The worst of the consequences of the “greater-recession” which began in 2000 have been mitigated by the Fed’s and the bank of Japan’s Quantitative Easing policies. For example with regard to the US Fed between 2008 and 2013 reserves held increased to nearly 2.5 trillion dollars. Reserve Balances Held at the Federal Reserve: St. Louis FED. When we look to Japan we see from the chart below that the level of assets it holds as a percentage of GDP was a whopping 45% in 2013. Size of International Central Bank Balance Sheets: St. Louis FED. This level of central bank intervention worldwide has completely skewed the operation of the free markets. The consequential low interest rates and the availability of easy money to large banks and institutions have resulted in a “corrupted” price formulation for commodities, real estate, stocks and bonds. Thus when we should be experiencing deep price contraction we have market booms across most asset classes. As every follower of Ludwig Von Mises knows when you manipulate the pricing mechanism of the free market nobody knows the true value of anything anymore and accordingly resources become mis-allocated. Most K wave theorists observe this development with grave concern. 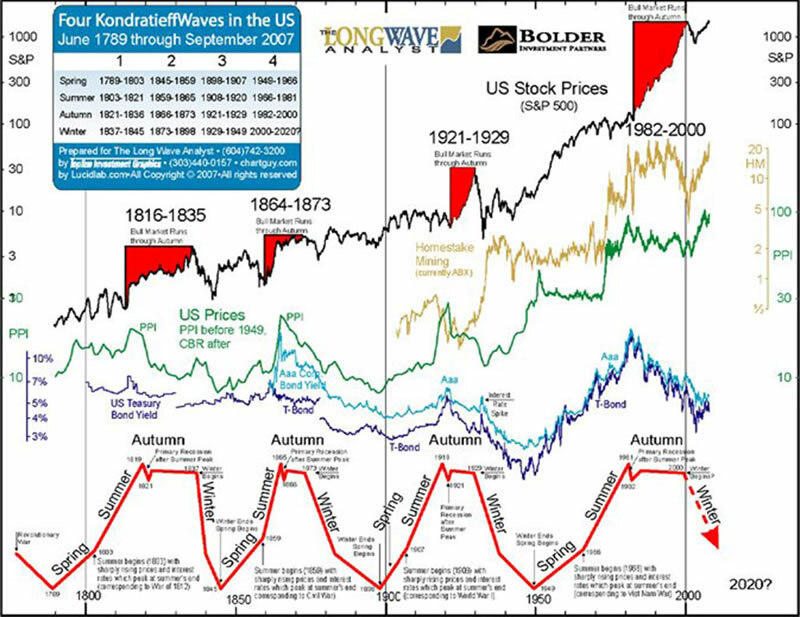 They know that there have been nearly 18 K wave cycles in world economic growth since 930 AD and the current manipulation of “natural” prices is only going to make the current Kondratieff winter more catastrophic when it really takes hold. In other words the K winter cycle has been pushed out but it has not been neutralized. Anyone who does not realize that the USA is actually in a near depression should look at the chart below. The level of central bank “ownership” of the US economy was near 1929 “great depression” levels in 2012 and things have deteriorated since then. Historical View of Federal Reserve Balance Sheet: St. Louis FED. How long financial engineering, interest rate swaps, economic statistic modification and stock buy-backs can be used to fudge the economic “greater recession” we are living through is anyone’s guess. When, due to the potential bankruptcy of the central banks of Japan, the EU, England and the US the current musical chairs of floating currency wars, negative interest rates and quantitative easing stops, my intuition tells me the true nature of our economic vulnerability will become visible for all to see. It is my contention, as mentioned in the last essay, that the current “recessionary” reality should be accepted for what it is i.e. a depression and dealt with through honest policies rather than through “smoke and mirror” QE delusion. World leaders must accept the reality of Kondratieff’s credit cycle discovery and let the current “natural” international credit contraction take its course. 2. Promotion of creative development. 3. Limitation of government regulation, taxation and control. 4. Efficient market pricing and asset allocation. 5. Availability of new non debt money to finance real growth, efficiency and productivity. 6. Distribution of purchasing power through fair wages and conditions. 7. Promotion of a new banking system based on sustainable economic growth rather than negative money. The current policies being endorsed by the likes of the European Union are the antithesis of the above. Instead of debt liquidation we have debt sustained by additional debt. Rather than have wage growth we have zero hour contracts with no minimum wage protection. Instead of the promotion of new industries with cutting edge research and development we have existing conglomerates stifling innovation through pork barrel regulation and repressive government control. The longer the inevitable K winter is ignored, the more violent will be the eventual political, social and economic collapse. As the famous character Chancy Gardner said in the classic movie “Being There”: “after the winter, economically there will be growth in the spring”. However, we must be courageous enough to allow the current K winter to become fully manifest for this re-growth to occur anytime soon. Crushing legacy bank debt is the problem. Debt liquidation through deep economic contraction is the solution. As long as this Kondratieff truth is denied the longer will be the delay in the commencement of world reinvention, renewal, rebirth and expansion. St. Louis Fed: “The Rise and Fall of the Fed’s Balance Sheet”. Lowell Ricketts & Christopher J. Weller, Jan. 2014. Christopher M. Quigley February Feb. 24 2012.